I recently went through my notes from the Ralph Bunche papers at UCLA, some of which had been already posted: https://clarespark.com/2014/05/17/miracle-man-ralph-bunche-saves-the-un/. You may remember that he became Acting Mediator for the Arab-Israeli conflict after the Stern Gang assassinated Count Folke Bernadotte, September 17, 1948; the [pseudo] settlement of this conflict was a test case for the efficacy of the new United Nations after WW2. 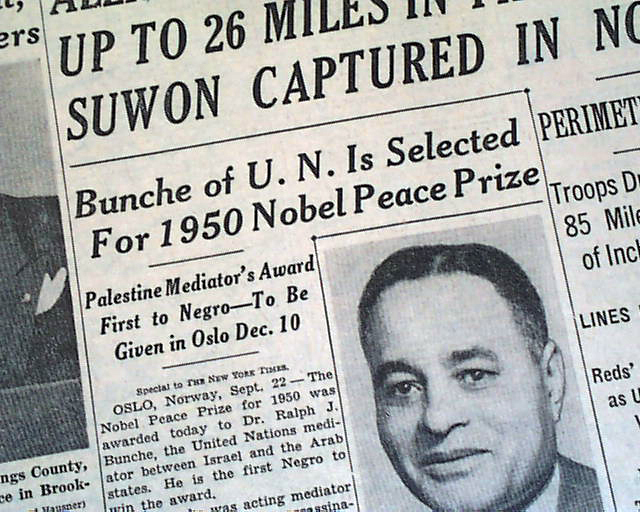 Indeed, Bunche won the Nobel Peace Prize for his ‘successful’ mediation that resulted in the 1949 armistice lines between Israel and her neighbors. Earlier, in the 1930s, Bunche was a leftist, possibly a member of the CPUSA, though that is hard to pin down, as he was all over the various left factions that fought with each other during the Great Depression. Some will see him as solely as a follower of Norman Thomas or A. Philip Randolph. But he wrote to Alger Hiss in support of his struggle with the anticommunists, and he was also on the editorial board of the communist publication Science and Society (though he later resigned). I made a photocopy of a strongly anti-imperialist, anti-racist declaration of W. E. B. Dubois from the mid-1930s, and find little in Bunche that deviated from the DuBois anti-capitalist positions. Indeed, Bunche’s pamphlet A World View of Race, autographed by DuBois, is an anti-racist, anti-imperialist classic of the genre. By that, I mean that he aligned with those State Department figures who wished to cooperate with Arabs (whose oil was crucial), and who were also eager to maintain an increasingly shaky alliance with Great Britain against the Soviet threat. But perhaps the most important point to take away from this brief summary of Bunche’s politics is this: RB entirely accepted the UN and State Department line that the question of a Jewish state must be framed as two victimized peoples fighting over a small strip of land, strategically located for the failing British Empire. Nearly all the scholarship that followed takes this identical, incorrect line. 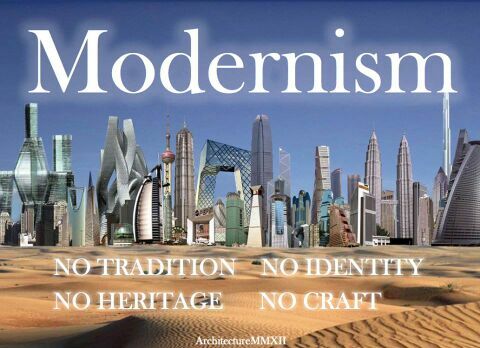 What is modernity? To its reactionary enemies, modernity signifies economic development along with the rise of banks and financiers, political democracy, the emancipation of the inquiring mind, a free quality education for all children, urbanization, secularism and pluralism, but above all, equality under the law for rich and poor alike. But for the Muslim world, the emancipation of women was probably one of the most painful developments as it was a symptom of reduced paternal authority in the family. I remember reading a book from the late 1940s that registered the indignation that Israel’s enemies expressed at the sight of sabra women going about, unaccompanied, wearing shorts and sandals. Even my most erudite friends fail to see this distinction between fighting over land and borders and the “Pan-Arab” resistance to modernity. An incorrect analysis leads to bad strategy, destructive school curricula, and worse journalism that more often than not, concludes in some form of moral equivalence between Jewish and Palestinian atrocities: an ideological analysis based on irrational antagonism toward “the Other.” (see https://clarespark.com/2012/10/11/the-other/). What neither Bunche nor pundits in our own time saw with respect to the Arab-Israeli conflict was as follows: It was never about land and borders or “Otherness.” The “question of Palestine” was always about Muslim resistance to modernity. And Jews along with emancipated women signified a rupture in human history that was intolerable. Modern machines, modernist skyscrapers, and technology, along with other common antimodern tropes, had nothing to do with their animus against a Jewish state. Most disturbingly, Bunche made it his mission to preserve the legend of Count Bernadotte’s greatness; agreeing with him that the displaced “Palestinians” should enjoy the “right of return”, and carefully editing out of Bernadotte’s memoir all evidence of hostility to the Jewish leaders they encountered during their “peace” efforts in 1948. It is astonishing that Bunche, a very astute person, did not see that at the time; perhaps it was a leftover from his days on the anti-imperialist Left. Moreover, his lack of understanding (the Palestine problem is insoluble), suggests that though he was a highly educated person and very liberal and systematic in his notes on Africa, he was morally compromised by his alliance with more powerful men. Bunche’s disgust with antisemitism, the main subject of my article on his relations with Myrdal, probably reflected 1. The communist line at the time, and 2. The Jews he praised were probably communists supportive of the labor movement; his anti-antisemitism probably did not reflect his deeply held beliefs. I find it painful to acknowledge this. His diaries are not free from disdain at Jews who fawned over him. Is there not a popular Hollywood genre of the apocalypse brought on by those commercial values foisted upon the world by merchants (a.k.a. Marx’s Jewish hucksters)? Would there have been a Renaissance, or an Age of Discovery, or the expansion of the West without them? Would we have great cities of the type anathematized by such as the arch reactionary Eric Gill without these dread traders? How much has this antimodern narrative penetrated into the popular consciousness to the detriment of mental health? And to what extent did the genre of film noir reflect such fears? Or such recent films as Revolutionary Road? In my view, we neglect such questions to our peril. If we cannot recognize “progress” where it has actually benefited humankind, how can we even begin to talk about appropriate remedies for emotional distress (depression! anxiety! ), let alone public policy in such crucial matters as health care reform? Just asking. For more on the popularity of “Melencolia I” in the last two centuries see the passages on James Thomson (“B. V.”) in https://clarespark.com/2009/10/23/murdered-by-the-mob-moral-mothers-and-symbolist-poets/ , part one of a two-part essay that shows the links between antisemitism, misogyny, and antimodernism. 2. The New Left and the counter-culture of the 1960s defined themselves against the soul-less cities (see the blog), celebrating rootedness and other tropes of the agrarian ideology. Remember the class base of utopian socialism in the 19th century? It was not the working class, but would-be patricians of the kind once identified as aristocratic backwoodsmen by G. C. Webber in his book on right-wing factions. Do I detect the color Green in their vaporings? 3. The Jews, in league with certain Scotsmen, are blamed for the disenchantment of the world. This was brought home to me by the J. C. Squire papers at UCLA. (Squire, a Tory poet, traveled from Fabianism to support for Italian Fascism. He was part of the English Melville revival.) It is also spelled out in Herman Melville’s sketch of a Dissenter in his late poem, _Clarel, a poem and pilgrimage in the Holy Land_ (1876). These works build upon the pervasiveness of the mad scientist in popular culture, made famous in spin-offs of Mary Shelley’s _Frankenstein_. The best book I ever read on the subject of disenchantment was Tillyard’s short work, _The Elizabethan World Picture and Shakespeare’s History Plays_. As the Biblical higher criticism proceeded in the 19th century, Melville nervously complained about the loss to imagination by historical analysis of the Bible. His despair reflected that of James Thomson, author of _The City of Dreadful Night_ . 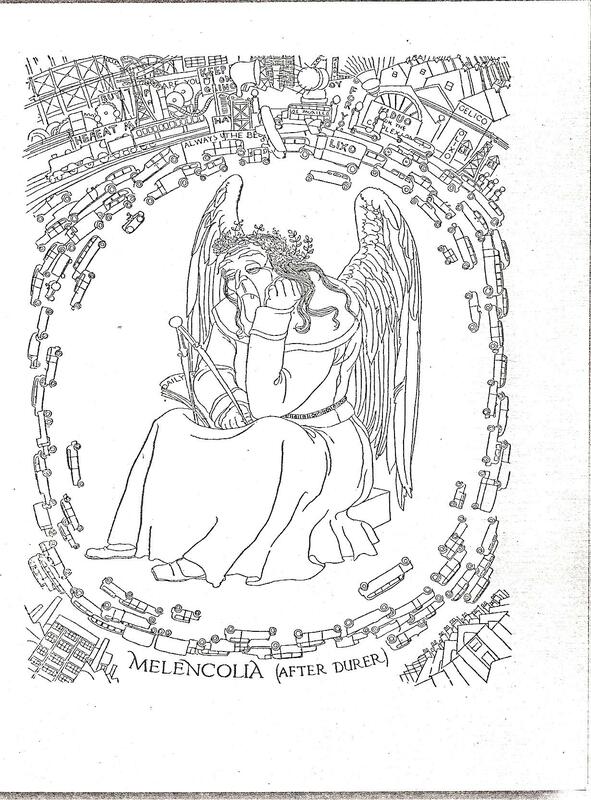 We are back again to Dürer’s Melencolia I and the panicky reaction by Church and King to the advent of the scientific revolution, the Reformation, and other seemingly apocalyptic events. If the Jews are constantly seen as the vanguard of modernity (either implicitly or explicitly: think of the diabolic trinity of Marx, Einstein, and Freud), they get the blame. And a scientific outlook becomes “reductive” and an abomination. 4. If one is an upwardly-mobile assimilationist Jew (on the lam from mom? ), it is probably little comfort to acknowledge the persistence of genteel antisemitism in the canyons of Manhattan, or in the heart of the non-Jew one has snagged. This hardly needs elaboration. Better to repress the entire subject. If we underweight antisemitism as a destructive force in the human psyche, imagine how bad is our underestimation of the power of sexism and patriarchy. To what lengths will the ‘feminist’ ‘anti-imperialist’ go to minimize the desire to control women and mothers in particular, and not just in the Muslim world? 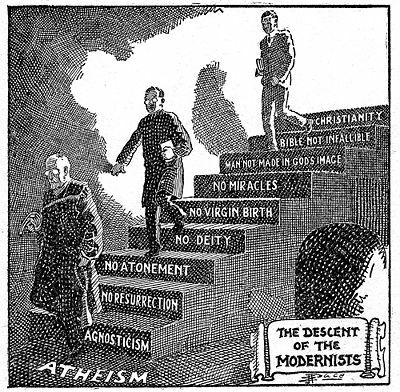 I will not belabor this point here, except to note that for Eric Gill, Melencolia is a sick old lady who would be better off dead than modernized/urbanized. History for these antimodernists is not susceptible to human understanding and agency, but is a subset of “natural history.” When we understand that, there might be some progress in the teaching of the humanities. For a related blog see https://clarespark.com/2012/09/28/bibi-and-the-human-nature-debate/.